On April, 4th 100 years to Dmitry Vladimirovich Sokolsky, the academician, the honored worker of a science of the Kazakh Soviet Socialist Republic, the Hero of Socialist Work would be executed. His heritage – more than 1500 publications, including 20 monographies, he has received more than 300 certificates of authorship of the USSR and patents of foreign countries. Numerous disciples pardonably name him Teacher from the big letter. Dmitry Vladimirovich is the founder of the scientific catalytical schools in our republic. Considering that new chemical processes for 90 percent are catalytical, it is easy to understand, what extent actual speciality was chosen to itself by the aspirant of Moscow State University D.V. Sokolsky in 1934. Development of this direction became both the purpose, and meaning of all his life. The well-known N.D. Zelinsky was present on the dissertation defense seldom. Why he has come to listen to Sokolsky? Whether not therefore those researches of the competitioner of a scientific degree of the candidate of sciences defiantly intruded in his “possession”, and results disaccorded with the point of view of the academician? Many a man knew about it, and the term “defense” found the true, primeval sense. So or not so, but Nikolay Dmitrievich not only has come, not only attentively listened, but also has asked permission to speak. It was almost seventy five years ago. And shortly before Sokolsky’s defense he have acquainted with the dean of chemical faculty of Kazakh University Abiken Bekturovich Bekturov. He has invited Dmitry Vladimirovich to Alma-Ata. Is it far? – the dissertator has asked only. – Five days by train. So Sokolsky has headed the chair in twenty seven years, and two years after he have appointed a pro-rector. The youngest pro-rector in the country. Whether he thought then, that Alma-Ata becomes a city of all his life and that he like the scientist will grow together with equally young science of Kazakhstan? That here he will execute and will defend a dissertation for a doctor’s degree, will be elected as an academician and the vice-president of republican Academy of sciences which was created in front of his eyes? Whether thought, that alumnus of chair which he leaded almost thirty years, sticked together around the teacher, originated scientific school, which will win not only all-Union, but also the world reputation? He did think about nothing such most probably: in a youth, careless due to a glut of creative plans, you do not look far. And his plans were huge indeed: he want to create, no less, no more, the unified theory of catalysis! Namely unified: catalysts, these “drivers” of chemical reactions, act everywhere – from giant factory installations till microcosm of a live cell. Not casually still yet great Mendeleyev asserted that there is no life without catalysis! …At the school Dmitry Sokolsky was fascinated with mathematics, history, the literature, but has decided to become the chemist. He has come to this decision in last class when to them have started to teach a course of analytical chemistry (such was in high school some time ago). It’s there now: you take two substances, dissolve them, heat up, shake up, and they, despite of everything, do not wish to have with each other anything the general. But it suffices to sink, say, a nickel strand of wire in a solution as rough reaction begins in a retort, and two recalcitrants disappear, giving way to new substance. A nickel strand – oh, miracle! – keeps a whilom face, does not lose weight and force and, apparently, it is ready to unite the unjoinable indefinitely. To unite – to create a new life! A circle of scientific interests of the young academician (he is only 41) is all wider, he and his first apprentices go untrodden paths in a science. Together with V.A. Druz – the future Doctor of Chemistry and the professor – he founds the foundation for absolutely new direction which in the methodical relation will define in many respects originality and the advanced positions of school of Sokolsky: electrochemical methods of catalysts and catalytical processes research. What for is it necessary? Dmitry Vladimirovich underlined repeatedly that the catalyst is a difficult, self-regulated system, almost live organism; it even can be compared to the human. And to learn character, features of the catalyst (as well as the human! ), it needs to be studied in the process of the vigorous activity, that is in a “live” condition. And scientists usually investigate catalyst characteristics when it is not “vivify” yet or already after moribundity that is before or after experiment. Electrochemical methods even as allow learning, retrace a condition of catalysts during reaction, and on the basis of this knowledge it is already possible to establish more precisely the mechanism of the reaction and to predict new catalysts. 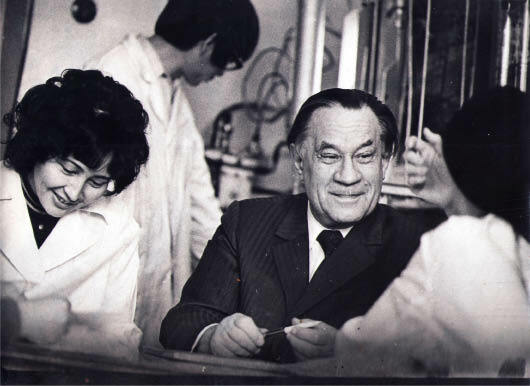 For the further development of this method the special laboratory has been opened at newly created Institute of organic catalysis and electrochemistry of the Academy of sciences of the Kazakh Soviet Socialist Republic. The top of the theory of catalytical processes of oxidation and reduction of various substrates developed by D. V. Sokolsky is the coordination theory of the catalysis. The theory of the coordination compounds structure has reached that stage of development when its main principles are not exposed to the doubt. Stability of theoretical views makes possible application of quantum mechanics regularities in heterogeneous catalysis. Use of quantum-mechanical models of metal-complex catalysis allows understanding more deeply the mechanism of hydrogenization – the basic catalytical process studied at the school of D. V. Sokolsky, to select teleologically new catalysts and optimum conditions for reception of the necessary compounds. Presently already proved that coordination and chemosorption are similar electronic interactions where collective electronic properties of the firm body play a secondary role. Collective properties are estimated by means of models of quantum statistics, and local properties of the firm body are predicted by methods of quantum mechanics. For a choice of the optimum catalyst both collective parameters of contact (Fermi level, electronic work function) and local characteristics of the catalyst (an electronic structure, promotion energy, and electro negativity) should be appreciated. Distinctive feature of coordination model of adsorption and hydrogenization on metals is that a clustered structure of a surface of the metal which is in the reaction environment is considered. At interaction of the catalyst with reactant and solvent, it becomes covered by an enough steady film of the clustered compounds which removal is hindered for the majority of metals. Conductivity of it clustered cover differs from the metal. The metal powder under influence of reactants and solvent crusted by a durable layer of the clustered compounds loses high conductivity which is inherent to it. Into composition of surfacial compounds enter both reactants of hydrogenization (hydrogen, unsaturated compounds) and solvent (water, surface-active substances). Adsorptive and catalytical activity of liquid-phase hydrogenization metals is defined by composition of this cover with a clustered structure. Thus, the coordination theory offered by D.V. Sokolsky and Ya.A. Dorfman has forestalled possibility of formation, stabilization and management and forecasting of finely dispersed metal-applied catalysts long before occurrence of terms with a prefix «nano». The correlation equations coinciding with experiment and facilitating elaboration of new catalysts are received by using coordination model of adsorption and hydrogenization on metals. It is offered to estimate coordination properties of metals, reactants and solvent by means of comparison of their electrochemical characteristics. On variety of examples of molecule activation it is shown that energetic and structural conformity can be estimated quantitatively. Energetic factors are characterized by chemical potentials of reactants, the catalyst and free energy of reaction. Structural conformity is understood as electronic similarity of reactants and catalysts on which the value of a constant of an intermediate complex formation and free energy of activation depend. At elaboration of new processes it is expedient to vary energetic parameters of reactants (nucleophilicity, electrophilicity, electronegativity, polarizability, oxidation-reduction potential, heat of reaction) and catalysts (Fermi level, work of exit) until their structural (quantum-mechanical) characteristics will not essentially change. The coordination model unlike other hypotheses allows predicting character of influence of proton solvation heat, biphilicity of solvent, reactants, catalyst, carrier, chemical potential of reagents on the speed and selectivity of hydrogenization in solutions. The theory of catalytic hydrogenization developed by D. V. Sokolsky constantly confirmed in practice at synthesis’s of fragrant substances components, vitamins A and Е, monomers and variety of other substances. He devotes special attention to hydrogenation of fats. New catalysts have been tested and implemented at combine in Chimkent. Many efforts were spent by employees of institute and chair of catalysis for all cycle of works – from laboratory experiments to multimeter columns on fat-and-oil combines in Chimkent, Kazan and Gorky. Corresponding member of Academy of sciences of the Kazakh Soviet Socialist Republic K.A. Zhubanov, Professor F.B. Bizhanov and their employees have tensely hacked. In the field of ecological catalysis the mixed low-percentage catalysts on the carriers containing a palladium and transitive metals oxides in small concentration are synthesized. They differ by thermostability and high efficiency in oxidation-reduction processes of gases clearing from carbon oxide, hydrocarbons and other toxic components of gaseous emissions of the industry and the transport. Dmitry Vladimirovich possessed to the full ability to attract talented students and post-graduate students, to learn and to foster them, to unite around perspective scientific idea. 22 doctors and 265 candidates of sciences are prepared under his leadership; the chair of catalysis of Kazakh National University has graduate more than 550 experts. And a training of personnel of a native nationality was his special care. It is known that the science cannot successfully develop without contacts between scientists of different schools, institutes of the different countries. D.V. Sokolsky was the organizer of all-Union conferences on catalytical reactions in a liquid phase having become traditional. The Soviet-Japanese and Soviet-Italian seminars on catalysis passed in Alma-Ata also. The institute was the participant of teamwork with the United States of America over a period of years. Our employees successfully trained at Princeton University (USA), at the Tokyo and Hokkaido Universities of Japan. In its turn many foreign scientists worked at us, joint researches under plans of many-sided cooperation were actively conducted (CSSR, Hungary, Bulgaria, GDR, Poland). Certainly, the basal return of such cooperation is difficult for estimating by economical effect – it is first of all researches level increasing, joint publications, using of rich instrumental park of foreign laboratories. But there are practical results also. So, the factory is sold to Turkey in one of shops of which the catalyst of Institute of organic catalysis and electrochemistry will work. Dmitry Vladimirovich acted himself at the international conferences on catalysis in Paris, Amsterdam, Varna and Tokyo, read lectures at universities of Prague, Budapest and Leipzig. He selected the honorable doctor of the Budapest Polytechnic University, have awarded with E. Votocheka’s medal of honour (CSSR). His monography «Hydrogenation in solutions» away back in the sixties was translated into English and soon became a bibliographical rarity. He was in time everywhere, possessing exclusive diligence. Around him – the Vice-President of Academy of Sciences and the deputy of the Supreme Soviet of Republic – the life always seethed, and numerous public duties were not for “tick” – he did not give rest neither himself nor other. Dmitry Vladimirovich read lectures in a number of universities of Hungary, Vietnam, and Czechoslovakia, worked as the adviser at the Ministry of enlightenment of Democratic Republic of Vietnam. Already after Dmitry Vladimirovich’s death the Scientific research institute of new chemical technologies and materials was created in 1992 on the basis of Chair catalysis and technical chemistry of chemical faculty of the Kazakh National university named for al-Farabi under the leadership of Zhubanov Kair Akhmetovich – his disciple, Academician of National Academy of sciences of the Republic of Kazakhstan, a doctor of technical sciences, professor. The principal direction of institute activity – development of theoretical and practical bases of new ecologically clean chemical technologies and materials based on the theory and practice of catalytical processes. The institute engineered the oil refining mini-factories processing Kazakhstan heavy, high-viscous, high-sulfurous petroleum with productivity 20-300 thousand tons of crude petroleum per year, providing reception fucls and oils of standard quality. In the project are put in pawn the newest scientific achievements of the Kazakhstan scientists on dehydration, desulphurization, petroleum demetallization, rectification processes, cracking, reforming with application of the best domestic catalysts and technologies that has been confirmed by pilot tests at mini-factory with capability 5-10 tons per day. Cost of mini-refinery makes $0,5-1,5 million depending on productivity. The mini-factories on coal liquefaction and full assortment of fuel and oils reception from synthetic petroleum are developed and engineered in SRINCTM. Unlike the foreign enterprises process is carried out at pressure 40-50 atm. that is less in 5 times than in foreign analogues. Productivity of factories is 30-200 tons of coal per day; cost is 4,5-6 million dollars depending on productivity. Catalysts and its manufacture technologies of processes of cracking, reforming, hydro clearing of “coal” petroleum and petrochemicals, stabilization of benzenes, diesel and jet fuels, oils and lubricants are developed. The list of the finished scientific researches and experimental engineer developments for implementation to industry of the Republic of Kazakhstan reckons 27 mini-installations for manufacture of POL, monomers and polymers of different allotment, medicinal preparations. The new nonconventional technologies including not only chemical but also mechanochemical activation (an electric field, an electromagnetic field, a sound, an ultrasound, a cavitation, a combined effect of electric field and a sound, an ultrasound in a resonant mode) of petroleum, coal, gases (cocurrent, petroleum, natural), catalysts, reagents for the purpose to increase hydrocarbon raw materials processing depth up to 96 % are developed. The interestingness in joint researches of not only world centers of science with which the Institute works within the frameworks of the international grants (INCO-COPERNICUS, NATO, INTAS, ISTC, etc. ), but also of other organizations with which SRINCTM spends collaboration, treaties about development, tests and commercialization of the technologies developed at Institute testifies about novelty and perspectivity of researches spent in SRINCTM. All aforesaid show that the fact that Dmitry Vladimirovich’s business lives and develops by his grateful disciples. He has left the lightest memory about himself in hearts of all who knew him, who conversed and worked with him.